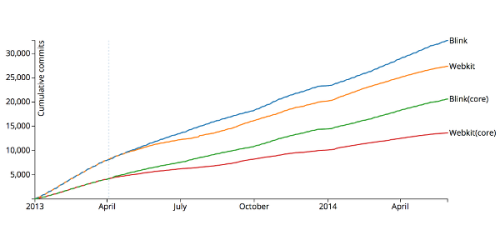 Some stats and analysis at a very high level of the Blink fork from Webkit. 2010 Mar 9, 5:24Classic I'm a PC, I'm a Mac rip-off. 2009 Jul 16, 3:28"I was up a ladder painting when I got the call from a lady with an American accent from Apple saying she was the head of legal affairs and that they wanted to acknowledge the work that I had done"
There can be no doubt that infomercial pitchmen Billy Mays and Vince Offer are awesome, but how can I decide which is my favorite? 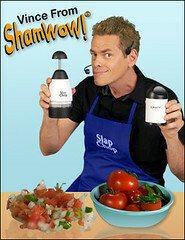 Among other things they sell Zorbeez and ShamWow respectively, both of which are absorbant towels so first up I can get a somewhat apples-to-apples comparison on informercials for comparable products. Thankfully someone has created a Vince Offer vs Billy Mays youtube video featuring these informercials. Billy has an upbeat yell to everything he says while Vince has an endearing condescension to his "You followin' me camera guy?" In the end I must give this one to Vince Offer. 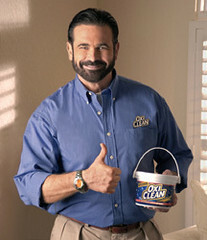 Billy Mays has a new show Pitchmen on the Discovery Channel, a reality show involving folks pitching inventions to the pitchmen Billy Mays and someone else. Vince Offer was arrested for assaulting a prostitute. A clear win for Billy. Windows allows for application protocols in which, through the registry, you specify a URL scheme and a command line to have that URL passed to your application. Its an easy way to hook a webbrowser up to your application. Anyone can read the doc above and then walk through the registry and pick out the application protocols but just from that info you can't tell what the application expects these URLs to look like. I did a bit of research on some of the application protocols I've seen which is listed below. Good places to look for information on URI schemes: Wikipedia URI scheme, and ESW Wiki UriSchemes. Some Application Protocols and associated documentation. search-ms Windows Search Protocol The search-ms application protocol is a convention for querying the Windows Search index. The protocol enables applications, like Microsoft Windows Explorer, to query the index with parameter-value arguments, including property arguments, previously saved searches, Advanced Query Syntax, Natural Query Syntax, and language code identifiers (LCIDs) for both the Indexer and the query itself. See the MSDN docs for search-ms for more info. OneNote OneNote Protocol From the OneNote help: /hyperlink "pagetarget" - Starts OneNote and opens the page specified by the pagetarget parameter. To obtain the hyperlink for any page in a OneNote notebook, right-click its page tab and then click Copy Hyperlink to this Page. itpc iTunes Podcast Tells iTunes to subscribe to an indicated podcast. iTunes documentation. Magnet Magnet URI Magnet URL scheme described by Wikipedia. Magnet URLs identify a resource by a hash of that resource so that when used in P2P scenarios no central authority is necessary to create URIs for a resource. mailto Mail Protocol RFC 2368 - Mailto URL Scheme. Opens mail programs with new message with some parameters filled in, such as the to, from, subject, and body. MMS mms Protocol MSDN describes associated protocols. "C:\Program Files\Windows Media Player\wmplayer.exe" "%L"
Also appears to be related to MMS cellphone messages: MMS IETF Draft. secondlife [SecondLife] Opens SecondLife to the specified location, user, etc. SecondLife Wiki description of the URL scheme. "C:\Program Files\SecondLife\SecondLife.exe" -set SystemLanguage en-us -url "%1"
skype Skype Protocol Open Skype to call a user or phone number. skype-plugin Skype Plugin Protocol Handler Something to do with adding plugins to skype? Maybe. svn SVN Protocol Opens TortoiseSVN to browse the repository URL specified in the URL. webcal Webcal Protocol Wikipedia describes webcal URL scheme. A URL that starts with webcal:// points to an Internet location that contains a calendar in iCalendar format. "C:\Program Files\Windows Calendar\wincal.exe" /webcal "%1"
zune Zune Protocol Provides access to some Zune operations such as podcast subscription (via Zune Insider). feed Outlook Add RSS Feed Identify a resource that is a feed such as Atom or RSS. Implemented by Outlook to add the indicated feed to Outlook. Like mailto but for instant messaging clients. Registered by Office Communicator but I was unable to get it to work as described in RFC 3860. "C:\Program Files (x86)\Microsoft Office Communicator\Communicator.exe" "%1"
Call phone numbers via the tel URI scheme. Implemented by Office Communicator. Sarah asked me if I knew of a syntax highlighter for the QuickBase formula language which she uses at work. I couldn't find one but thought it might be fun to make a QuickBase Formula syntax highlighter based on the QuickBase help's description of the formula syntax. Thankfully the language is relatively simple since my skills with ANTLR, the parser generator, are rusty now and I've only used it previously for personal projects (like Javaish, the ridiculous Java based shell idea I had). With the help of some great ANTLR examples and an ANTLR cheat sheet I was able to come up with the grammar that parses the QuickBase Formula syntax and prints out the same formula marked up with HTML SPAN tags and various CSS classes. ANTLR produces the parser in Java which I wrapped up in an applet, put in a jar, and embedded in an HTML page. The script in that page runs user input through the applet's parser and sticks the output at the bottom of the page with appropriate CSS rules to highlight and print the formula in a pretty fashion. I love ANTLRWorks, the ANTLR IDE, that didn't exist the last time I used ANTLR. It tells you about issues with your grammar as you create it, lets you easily debug the grammar running it forwards and backwards, display parse trees, and other useful things.